What does the future hold for your language? What is the future of our language? Is our language worth keeping? If we lose our language, what else might be lost? Can we shape the future of our language? Language communities should lead in making decisions about the future of their language. Understanding the causes of language loss, the challenge of language maintenance, and the resources available to meet this challenge will equip communities to make informed choices about their future language use. 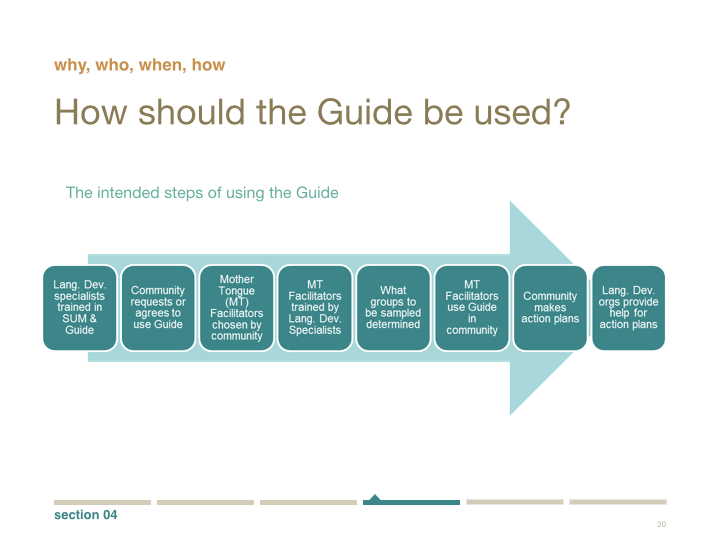 Respecting local ownership of language development, the Guide provides a model for understanding the factors which endanger a community’s language, and the actions and responses that would be needed to maintain that language in use. The community then decides whether it wants (and is willing) to make the effort required to invest in the maintenance of their language. Appreciate how all the languages they speak interact with each other, and what the functions of each are within their social life. Discover their community's current use of their traditional language. Become aware of the likely future of their language if nothing is done. This involves learning the patterns of language use that are sustainable for the long-term and those that are not.. Articulate what kinds of knowledge from both inside and outside the community they need to talk about. They answer for themselves which language will give them access to the desired kinds of knowledge and what kind of development that language may need. Examine the local resources that could be used to achieve each language development goal. They also learn about expertise and assistance outside groups like SIL and it's partners can contribute. The Guide to Planning the Future of Our Language is currently available in English. We hope that Portuguese, French, Bahasa Indonesia, and Malay versions will be available in due course. A resource manual (outlining additional activities, tools and examples) and Facilitator's Reference Materials are also available in English. Download all resources now by clicking on the appropriate language version below. If you are interested in talking to someone about running a workshop or training event on the guide, email gpfol_intl@sil.org. 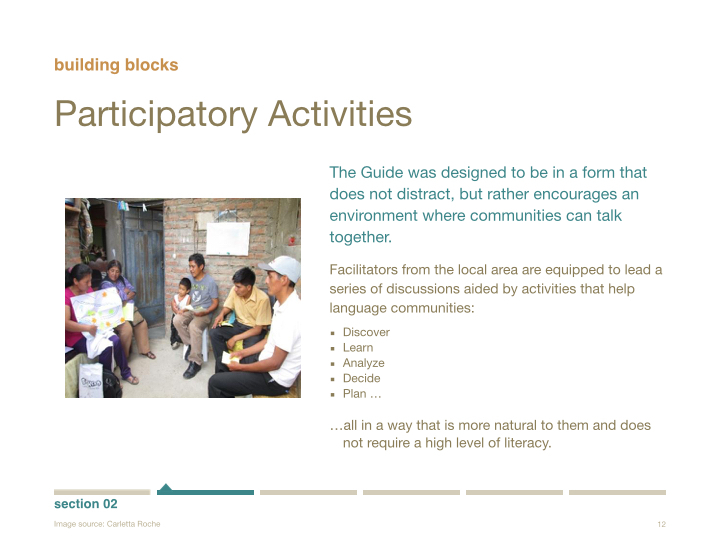 Sustaining Language Use is another helpful resource when doing community-based language development. Copies of this book can be purchased here. We want to hear your stories of how you have used the guide. Why not join our community of practice to share your experience of using the guide. Thank you for helping us improve the Guide!